New Drug Wipes Out Malaria In A Single Dose — But There's One Hitch : Goats and Soda Global health activists say it's a big step toward wiping out malaria. But it will be tough to implement in poor countries. 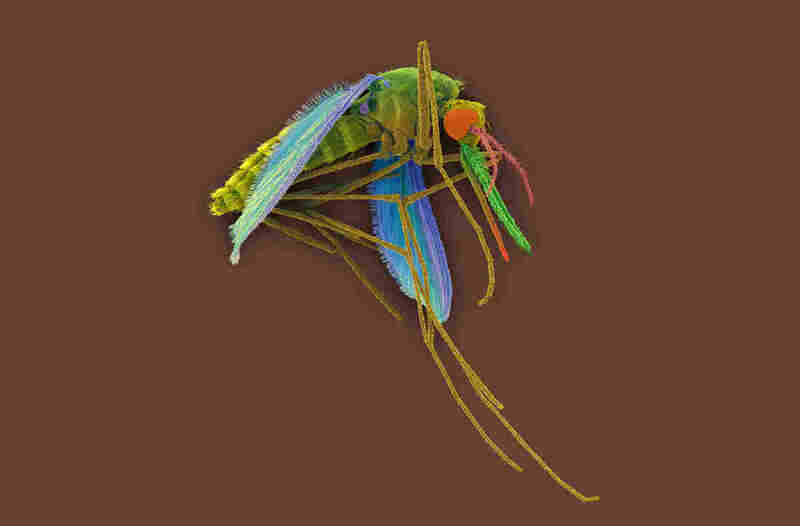 A colored scanning electron micrograph of a female Anopheles mosquito, a vector for the malaria parasite Plasmodium vivax. On Friday, the U.S. Food and Drug Administration approved a drug to cure a type of malaria that's been hard to stop. Called Plasmodium vivax, the parasite can hide out in a person's liver for months and cause multiple rounds of malaria — even after being treated. Some people can have more than a dozen lapses. The drug — called tafenoquine (branded in the U.S. as Krintafel) — prevents malaria relapses by about 70 percent, clinical studies have shown. "This is a major milestone along the road to ending the scourge of malaria for good," says the CEO of the Bill and Melinda Gates Foundation, Dr. Sue Desmond-Hellmann. The Gates Foundation funded the development of the drug, while the pharmaceutical company GlaxoSmithKline and the nonprofit Medicines for Malaria Venture manufacture it. (The Gates Foundation also funds NPR). P. vivax is the dominant type of malaria in Latin America and Southeast Asia. It infects at least 8 million people each year and has even taken hold in the U.S. from time to time. Since 1950, the U.S. has had more than a dozen outbreaks, the CDC reports. Tafenoquine is the first drug approved to fight P. vivax in more than 60 years. And it's much simpler to use than the drug currently available, called primaquine, which typically requires a person to take the medication for two weeks. That regime can be hard for many people to finish, says Gonzalo Domingo, who leads the malaria diagnostic team at the nonprofit PATH in Seattle. "Primaquine is operationally challenging to implement," Domingo says. "Tafenoquine represents an opportunity to ensure patients are cured of P. vivax malaria." But there's just one big hitch: To use tafenoquine, doctors and nurses need a sophisticated test that's not available in many poor places. In certain people, tafenoquine can cause red blood cells to burst open and die. As a result, people can become anemic, and in some instances, this can be lethal. Here in the U.S., there is a lab test available to see which people will respond poorly to Krintafel. It's called a "G6PD" test. The FDA and the World Health Organization require a health care worker to give this test before prescribing tafenoquine or other similar drugs. "It requires the kind of laboratory facilities that are not available where most people with malaria seek care," he says. But Domingo and his colleagues are trying to change that. Over the past few years, several companies and nonprofits have been working together to develop an affordable, easy-to-use test that runs off a battery. None of these tests are available commercially, Domingo says. They also aren't approved by health regulators. "Some products are currently entering evaluations in malaria-endemic countries," he says. But he thinks one of these tests will be ready in the next few years. And Desmond-Hellmann at the Gates Foundation agrees. "We're optimistic the test will be ready to be introduced as endemic countries begin rolling out tafenoquine," Desmond-Hellman says. In terms of cost, GlaxoSmithKline and Medicines for Malaria Venture say it's too early to say how much tafenoquine will cost in poor countries. "[We] are committed to making tafenoquine accessible and affordable on a not-for-profit basis to those who need it most," a spokesperson for GlaxoSmithKline wrote in an email to NPR. "A shared goal is for the cost of tafenoquine not to be a barrier to access."